With every day that passes, it becomes more difficult to draw the "fine distinctions" Geithner et. al. want us to pretend exist between saving financial systems, which we need and is our proper concern, and saving their rich buddies' asses for their bad investments, which is not our concern even as their idiocy has become our problem. The dire warnings over the "moral hazard" of simply devaluing home loans made during the bubble no longer sound so convincing when we watch the deliberate moral hazard of protecting the prerogatives of Wall Street in lieu of enacting anything approaching a rational fix to the financial system. Steve's formulation of nationalizing the downside and privitizing the upside captures the rotten heart of the various attempts to "fix" the financial implosion, from Paulson right through to Little Timmy. The intent is to protect the people who caused the implosion in the first place. This is the distinction that Little Timmy wants us to overlook by believing the lie that we are rescuing a system. Leaving the details of the financial analysis to the excellent people in the field, what strikes me most in this mess is the lack of political distinctions, or, more to the point, an unwillingness to draw them. What you do not hear from the White House is a political vision, policy or standard that sets the ground rules for the enaction of an economic plan. It is all piecemeal, deal with the uproar of the day, reactive rather than programmatic. This also fits the way taxes, housing, the auto industry, etc., is being treated. The continued fluffing of the Republicans in the name of bipartisanship is another example of the deeper problem, which is a lack of an over arching political goal for the sake of which you act. This is not so much ideology, though to be most effective it should be grounded in one. Example: The Movement Conservative obsession with killing Social Security (political goal) is grounded in their faith (ideology) that the New Deal was bad for the nation and must be dismantled. The goals of a political actor are what allows that actor to take advantage of political opportunities in creative ways, and acting on those opportunities are what change institutions and systems in fundamental ways. What has become clear in just one month, however, is that the Obama administration's sole political goal was getting him elected and that there is nothing more he really wishes to accomplish. Thus, we are left with the economic policy (such as it is) being handed over to the crooks and liars who got us into this mess in the first place because there is no reason not to. There's nothing The Precious wants to do with the economy or the financial system (like expand the New Deal), so whatever Little Timmy and Gucci Gang want to do is fine by him. The political opportunity presented by the economic crisis, well documented by people like Krugman and Roubini, is being frittered away for lack of political vision. Fine distinctions matter when political opportunities are at hand. As I knew she would. 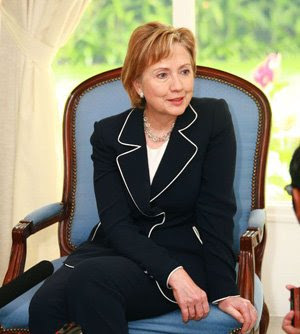 In the Hillary section in the righthand links, I have posted a link to the State Department's unfortunately named Dipnote blog, which is offering some great commentary on Hillary's rock star reception overseas. I am savoring this reporting after all of the crap the Blogger Boyz (and others) threw at her during the primaries and immediately after her name was floated for Secretary of State. Ben Moeling, the post's author, serves as the Deputy Political Chief at the U.S. Embassy in Beijing, China and Overall Control Officer for Secretary Clinton's Visit. Secretary Clinton arrived in Beijing on a cold February night after a full day in Korea. Two senior officials from the Ministry of Foreign Affairs were on hand to greet her officially, but hundreds of millions of Chinese people were also eagerly tuned in. The Secretary, or "Xi-la-li" as everyone in China refers to her with a tone both of familiarity and respect, is famous in China. Speculation about her visit has been intense. Almost every Embassy officer, from vice consuls to the Charge d'Affaires, has received inquiries about her upcoming visit. Our Political, Economic, and Environment, Science, Technology and Health sections have been working for weeks with our Chinese counterparts on the arrangements. Finally, it's game day. The Embassy is ready. Press from all over the world have gathered. The Chinese government is giving her an exceptionally warm welcome, and tomorrow she will meet with the President, Premier, State Councilor and Foreign Minister. The warm response to Secretary Clinton's first trip to China is literally overwhelming. Already, we've had to improvise. Our carefully arranged plan for her to meet the staff and families of U.S. Embassy employees had to be scrapped just yesterday because the number of RSVPs shot past the maximum occupancy of the venue we'd selected for the event. Despite the fact that the Secretary's only available window is late on a Saturday afternoon, 430 people have already said they plan to come back to the office to see her. I have noticed an incredible energy in the team that has come together to plan and execute this visit. This is not my first "S visit," and I am used to working with dedicated and professional colleagues, but this is somehow different. Everyone is so deeply invested in the success of this visit, no matter how big his or her job. Dozens of people have come up to me and volunteered to assist. I am excited, proud (and a little awed) to be part of it myself. Tomorrow is going to be a big day in U.S.-China relations. The embassy staff is turning out en masse to see her. She is called by her first name with endearment by ordinary people (and not just in China, I might add). The government is responding positively to her visit. They want her there. High and low alike are straining for an opportunity to see her. And this is what sets her apart from previous secretaries. It is almost too easy to compare Hillary's ecstatic reception to the lack of such reaction to Condoleezza Rice or Colin Powell, but Madeleine Albright could not generate this response either. Bush had tried to use Karen Hughes as some kind of public figure for outreach, but only managed to demonstrate the moral black hole at the center of his regime. This buzz, this palpable anticipation over Her arrival is what I was trying to identify in my posts from last November, The Politics of States and Against Conventional Wisdom. This is what I expected to see and why I wanted her to take the position. No need to rely on hope here. This dame has got the goods and she delivers. It hs been posted on a number of econo-blogs and deserves wide exposure. When you have a friend or family member who doesn't get what happened with the financial collapse and doesn't understand the difference between a CDO and a CDS, give them this link. Come to think about it, maybe someone should send this to the administration so they can see just who the guilty players are in the current crisis.